Floral Eco Maxi-Dress with Bright Accessories. Maxi-dresses and hot summer nights are a match made in heaven but even more so when a door in a complimentary and divine shade of blue is involved. 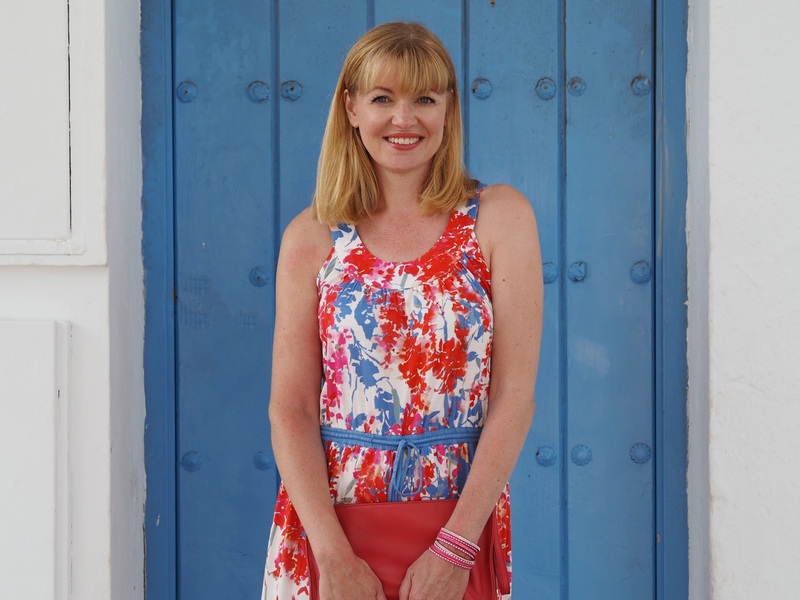 I first featured this door in my previous blog post in which I was wearing a white midi-dress with espadrilles, bought in Nerja, where we were staying when on holiday last week. It’s so lovely, I simply had to use it as a backdrop for another outfit and this white maxi dress with the vibrant floral pattern in reds and blues seemed the perfect choice. The dress is another one by eco-brand Braintree but bought from a small independent shop close to where I live in Skipton. It’s composed of bamboo-derived viscose and as such is soft and lightweight and drapes beautifully. The sparkly bright pink wrap bracelet is from my own accessories website, Lizzy O. There are several styles and colours (including turqouise, rose-gold, silver, black and leopard-print), and they are ideal in warmer weather because they’re lightweight and comfortable. For the duration of the Rio Olympics, I am offering a 10% discount on everything, (Danon jewellery, wrap bracelets, pendants and scarves/sarongs), with the code RIO. It is worth noting that at the time of writing the dress is reduced at From The Source from £59.90 to £42 (mail order is available). It is still full-price on the Braintree website. I’m a UK dress size 10-12, 5 ft 9 tall and am wearing a size small. *Red leather cluth bag, Kaleidoscope, past season. Please follow along on Instagram and Facebook for more. *Disclosure: This item was gifted. All opinions are 100% honest and all content is my own. Thank you for supporting the brands that support What Lizzy Loves. This looks beautiful on you Liz. Love Braintree but find their sizing hit and miss. I am a 14 but have both M and L sizes depending on the style.